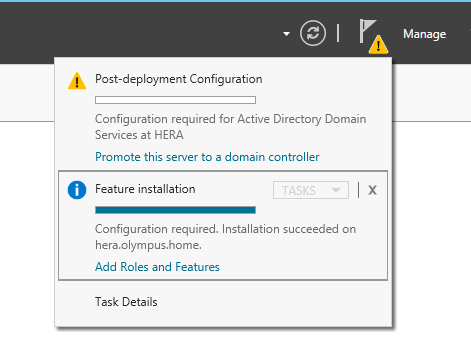 It being past time for me to upgrade Active Directory at home to DCs running 2012R2, I wanted to put together this little walkthrough for others looking for a procedure doc to cover schema and perms, or maybe even where the hell dcpromo went! If you’d like a 20K foot overview of what you need to do in order to add a 2012R2 DC to your domain, here’s what you need to know. 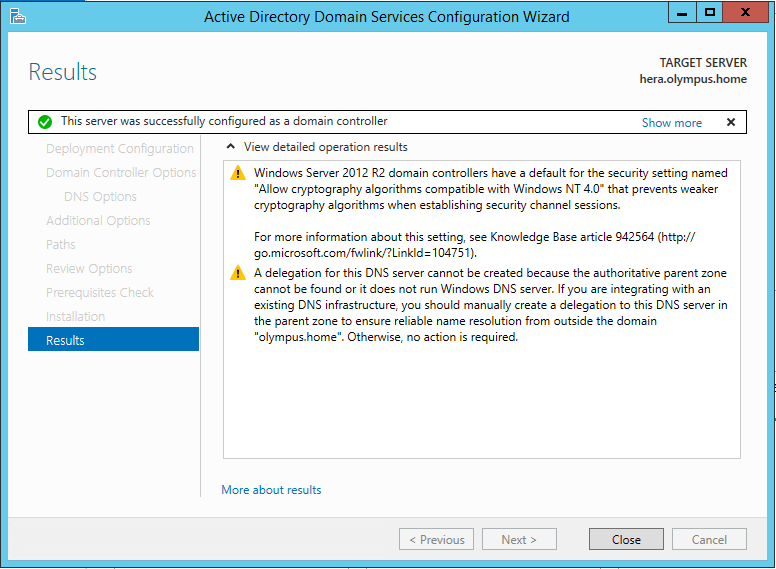 To add a 2012R2 DC, you will need to update your schema, permissions in your domain, and possibly some GPOs. You will also need to be free of Windows 2000 DCs. Build a 2012R2 box, make sure the DVD is still mounted, change to D:\support\adprep, and get ready to rumble. Upgrade your forest schema. All DCs must be at least 2003, you need to be a Schema Admin, and should run this on the Schema master. Press C to continue and hit enter. Expect this to take several minutes to complete. If your Domain Controllers were running 2008R2, your AD schema version up until now was 47. After this completes, you’ll be at 69. Adprep will need to load and import LDF files for all changes from 48 through 69. These take time. Some are larger than others, so best go get coffee rather than watching it. Upgrade your domain(s.) You should be an Enterprise Admin, or a Domain Admin per domain, to do this. If you have legacy GPOs (say, you’re coming from 2003) you need to also do the adprep /domainprep /gpprep. If you don’t need this, there’s no harm in trying. 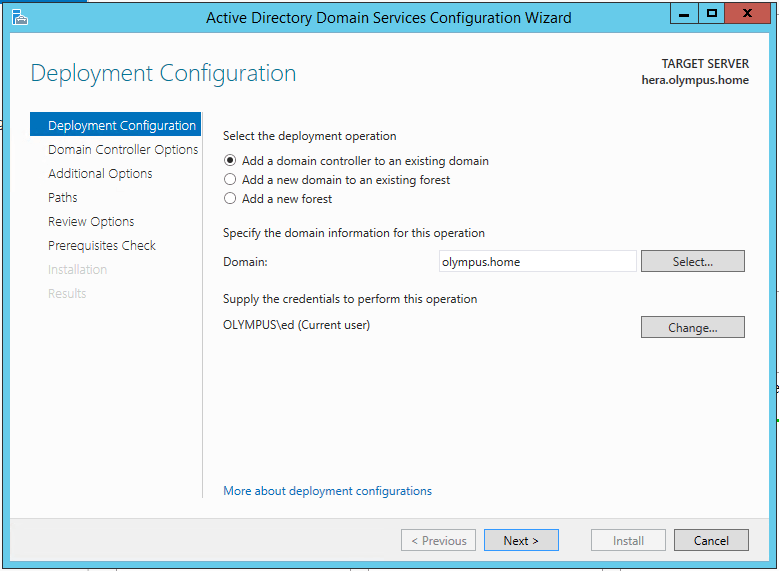 Launch Server Manager, and add the Active Directory Domain Services role, plus any others that you want to add, like DNS! Once the install is done, note the subtle little yellow icon up near the top right of Server Manager. Click that to see the new replacement for dcpromo. Whiskey-Tango-Hotel. This launches the wizard formerly known as dcpromo. You should feel pretty comfortable now with this. Follow along, choosing the steps you want to take. Mind that some of the text boxes are so subtly outlined that you have to click on them (next to the asterisk) before you can tell they are boxes. And with that, you have a 2012R2 DC. You can start to transfer FSMO roles in preparation for replacing your others, or just let it hang out and do what DCs do best. The choice is yours. Next PostNext Where in the blue hell is sysprep?